From these figures we can conclude that the maximum power output of next season’s power units will be at least 761bhp, which is 11bhp higher than the outgoing V8 engines. 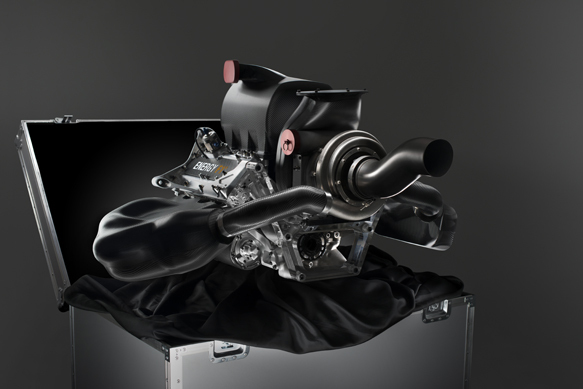 It is the delivery of this power that will be the major challenge for the engine manufacturers and teams next season. You will also notice the fuel flow rate is at 100kg per hour. It is also no coincidence that the maximum fuel limit allowed next season is at 100kg. This has prompted questions regarding dramatic fuel saving, as races last well over an hour in duration. At the moment the teams do not seem too concerned about it so the engine manufacturers could be doing a great job on extracting a large amount of performance from well under the maximum fuel flow limit. However it does seem a bit touch-and-go: using a rich fuel mixture while attempting to pass a car ahead could cost the driver dearly come the final few laps. It could either be an interesting game of cat and mouse or a disappointingly boring cruise. The ERS system’s harvesting energy is limited to 2MJ per lap, whereas the battery has a capacity of 4MJ. As the additional power boost is mapped into the engine system, this suggests that the drivers will have an ERS map available to adjust on the steering wheel, opting to use full power output only when necessary. In a sense the driver is still flicking a switch to access the additional 161bhp power from the electric motor but they do not have the freedom to access it whenever they like. Think of it as a fuel mixture setting. The ERS settings will also allow for various combinations of power against time. At maximum output, the ERS will create 161bhp for 33.3 seconds per lap. However this can be changed to 80.5bhp for 66.6 seconds, 40.25bhp for 133.2 seconds and so on. I mention the weight and placement of the battery because Red Bull have been utilising a split battery layout either side of the gearbox casing in recent years. This is a small detail that improves packaging but can be quite unreliable, as demonstrated on numerous occasions! The battery must be a single unit and placed beneath the fuel cell. This will improve the Centre of Gravity (CoG) but the battery is heavier due to its greater capacity. The battery will create a lot of heat and it is in an awkward place to cool so there might be some issues to start with. The power units will be mounted to a gearbox with 8 forward ratios plus a reverse gear. The extra gear is used to exploit the additional torque that a turbocharged engine offers although first gear will only be used for launch and during the pitstop phase. 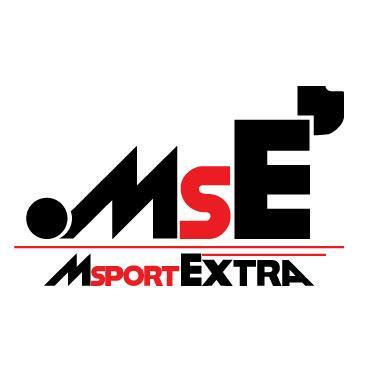 The ratios must be assigned before the season begins, with the teams allowed one opportunity to change the ratios should they come across any miscalculations. It is also worth mentioning that the crankshaft height has been raised to 90mm above the reference plane, 32mm higher than the V8 era. 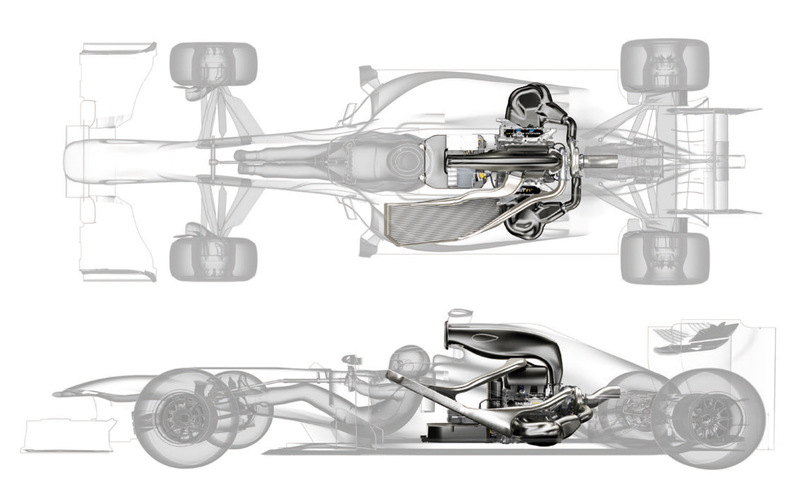 This will have an influence on gearbox design and it prevents teams from designing an ultra-low lying gearbox such as the one Williams have been running over the past few seasons. Aerodynamically this won’t be a huge issue but it blocks a potential area to weight save. The consequence of the new power units and Pirelli’s 2014 specification tyres is that the maximum weight limit has been raised to 690kg (in 2013 it was 642kg). Teams are suggesting that it will be a struggle to be within this bracket so any weight-saving opportunities will be fully exploited. The overall CoG of the engine will be higher as a result of the raised crankshaft, although the low-lying battery unit could help negate this consequence. 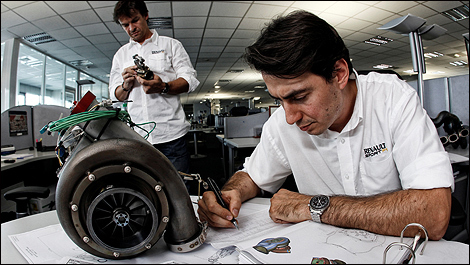 The 2014 F1 specification turbocharger has some very interesting characteristics compared to a normal, road-going turbo. If you want a bit of background knowledge on the fundamentals of a turbo I wrote a short piece which you can find here on this blog. Unlike a traditional turbo, an small electric motor will drive the turbine at low rpm, spooling the system even with limited exhaust flow. This should increase the driveability of the power units and cut turbo lag significantly. Another unique feature of next year’s turbocharger is the installation of the Motor Generator Unit – Heat (MGU-H). The MGU-H is one of the two devices on the car that make up the ERS, the other being the Motor Generator Unit – Kinetic (MGU-K). The MGU-K is the same concept as KERS: it harvests energy under braking, converts it into electricity and drives the electric motor. The name MGU-H is rather misleading as it does not generate energy directly from the heat of the exhaust gases within the turbo. It instead recovers energy from the turning motion of the turbine within the turbo unit. Instead of a wastegate, the turbine within the turbo is fitted with a generator. Normally, as the engine rpm increases, more exhaust gases are created and therefore the turbo spins faster. Traditionally, a wastegate valve is used to bleed off excess exhaust gases to prevent the turbo from over-speeding. However the generator recovers more energy as rpm increases, acting as a resistant force to the oncoming exhaust gases and preventing over-speeding. This resistance allows the turbo to reach a maximum limit of 125,000rpm at maximum fuel flow rate without over-speeding. As far as I am aware Variable Turbine Geometry (VTG) is not permitted within the regulations. VTG is commonly used in turbo-diesel road cars, changing the diameter of the rotor blades to suit varying rpm. In basic terms, the rotor blades are able to reduce in size at low rpm to raise its sensitivity (reducing turbo lag) before increasing in size at high rpm to spin the turbine faster. The aerodynamicists won’t have it all their way next year as cooling will be one of the biggest areas of focus on the car. The engine itself needs cooling, the bigger battery and electric motor generate more heat, the turbo requires an intercooler to extract maximum power from the engine and then there is the gearbox plus the electrical systems. On the positive side, the V6 engine itself will produce less heat than the V8. 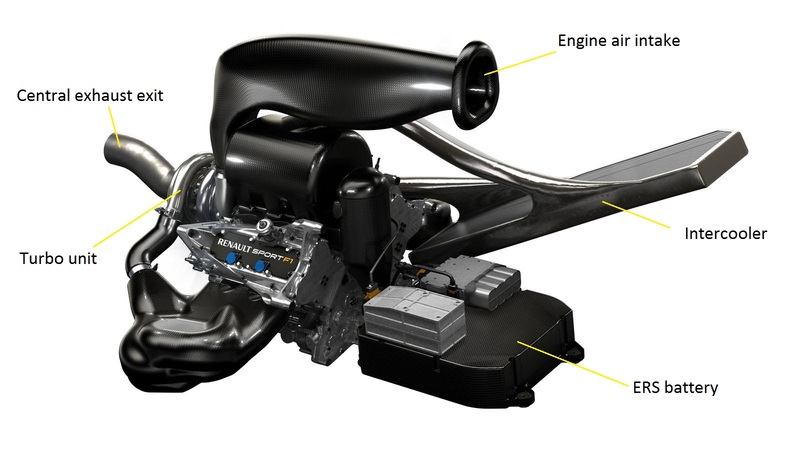 This will probably result in a single radiator to cool this aspect of the car, housed in one of the sidepods. The other sidepod will be occupied by the turbo intercooler. As a result of the higher cooling demands the sidepods will undoubtedly be bigger in size. This has various aerodynamic implications, such as reducing the volume of laminar flow reaching the top of the diffuser. This could prove to be a crucial area for development to extract more from the under-floor aerodynamics. There will be additional cooling louvres, ideally placed to remove hot air from the car whilst attempting to maintain aerodynamic efficiency. The 2014 regulations have effectively outlawed any direct aerodynamic influence on the car by placing them in an aero neutral region. 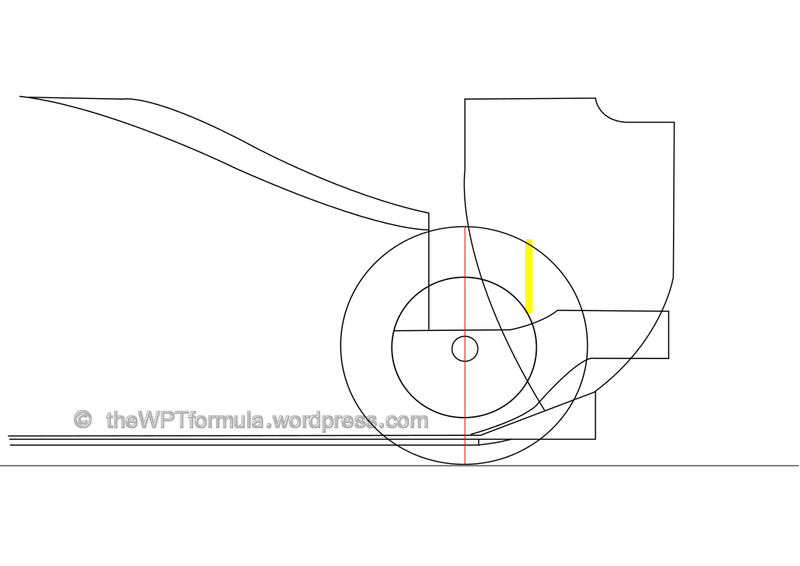 The pipe must exit 170-185mm behind the rear wheel centre line and between 350-550mm above the reference plane. Offsetting the exhaust by up to 100mm either side of the car is also allowed although I can’t see a huge benefit in doing this. Bodywork must not sit along the exhaust axis and not within diameter 30mm greater than the tail pipe. The exhaust exit will sit above the rear crash structure, so say the pipe is precisely 15mm above the crash structure, any bodywork above the tail pipe must be at least 15mm away. This basically stipulates that there will be no exhaust blown bodywork, in particular blown monkey seat winglets which sit directly above the exhaust pipe exit. The final 150mm of the exhaust pipe must exit at an angle between 0 and 5 degrees when viewed from the side. The yellow box indicates the region in which the exhaust pipe must exit. It’s a narrow but tall window so there is plenty of scope for different Y75 winglets. Maximum fuel rate starts at 10500 rpm I think ? MGU-K MORE FAST AS THEN 2013 ? It has double the power over last year’s KERS.